To improve on an already great tandem is a real challenge. But we took time to collect impressions and feedback from many pilots around the world, analysed and implemented improvements. The result is the new RIDE2. With even more stability, better take-off behaviour, more agile handling, an improved usable trim-range, as well as more overall performance and better climb ability in thermals. The RIDE was already well known for its easy take-off characteristics. The canopy of the RIDE2 rises even easier overhead. It demands less power and therefore take-off is better, even in challenging conditions. The RIDE2 shows an even higher stability than its predecessor. In addition, the complete trim range is more usable, also in turbulent conditions. Even with trimmers in the fully opened position, the glider is very stable at speed and exhibits minimal sink rate without sacrificing glide. The RIDE2 also features the typical ‘AirDesign Comfort-in-Flight’ feel. This means stress-free flying, even in rough conditions. The glider dampens turbulence well and is extremely confidence inspiring. Entering thermals, you will immediately notice that the handling is much more agile. The RIDE2 is very responsive under brakes and its handling is extremely well balanced. Once in a thermal, the wing turns with only minimal effort – similar to a solo-wing and tight turns can be made with ease. The reduced brake pressure is comfortable, provides solid feedback, and exhibits a progressive feel right through to the stall point ensuring that landing effort is simplified with increased flare ability. By implementing RazorEdge technology it was possible to increase the RIDE2’s glide performance markedly. This special trailing edge sail-shape provides cleaner, more effiencient airflow, therefore reducing drag. It also features a 3D-cut leading edge, further improving performance, safety and overall flying characteristics. We had already done long-term tests with the RIDE. Even after 600 flights , take-off behaviour remained unaltered. With the RIDE2, sensitive areas such as the leading edge, have been improved and supported to make sure that the take-off behaviour and flying characteristics reliably remain for an even extended lifespan. • The leading edge is supported by polyamide rods, which ensure a constant inflation and good take-off behaviour over the full lifespan of the wing. • Optically, the leading edge is outstandingly aerodynamically clean, which produces a performance advantage in flight. 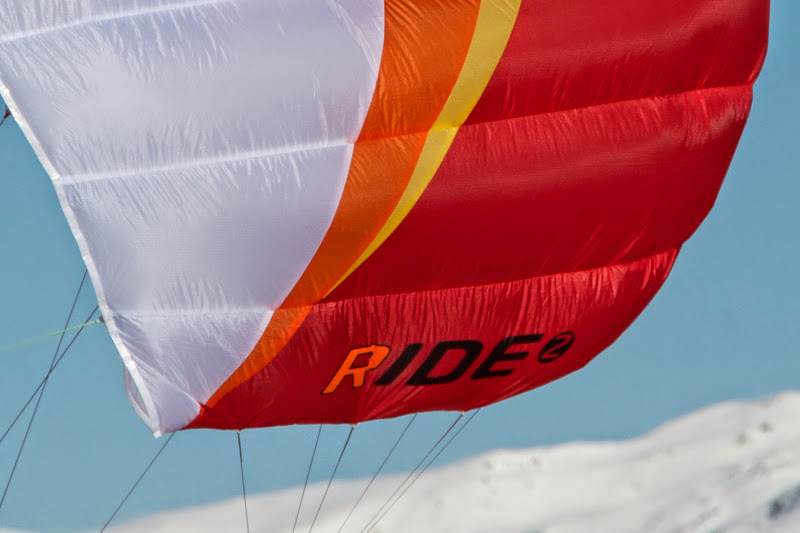 The RIDE2 is equivalent in performance to high-end LTF/EN-B solo gliders. • The RIDE2’s trimmers allow for positive or negative trim range options. With trimmers open for light loading and in stronger conditions - or closed when higher wing loadings, the RIDE2 will deliver consistent and comfortable flying characteristics throughout the entire weight range. • The line layout utilises a combination of sheathed Dyneema and Aramid lines to maximise stability and durability throughout the life of the wing. The upper cascade is designed with increased line attachment points also with the integral element of longevity in mind.